As the film-adaption of "Star Trek" continues to make headlines, William Shatner says he can't understand why he wasn't asked to make a cameo. “How could you not put one of the founding figures into a movie that was being resurrected? 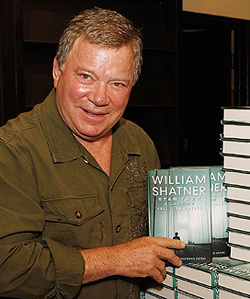 That doesn’t make good business sense to me!” Shatner said at a signing for his book, "Star Trek Academy: Collision Course" in Hollywood. Director JJ Abrams has offered Leonard Nimoy and several past cast members the chance to make a cameo in the sci-fi spectacle. Shatner told “Extra” that he would have been great for the film, insisting, “I’ve become even more popular than I was playing Captain Kirk. I’m good box office and I get publicity….But, they are going in a different direction and it’ll be a wonderful film."